Even in Spring Training, Beating the Cubs is Awesome ~ The Bucky Channel - The World of Sports from Wisconsin's Perspective. Jeff Samardzija is a tool. That's why even in Spring Training, getting five hits and scoring five runs off of him in two innings is an enjoyable thing. Actually, Samardzija probably isn't that bad of a guy, but playing for the Cubs (and going to Notre Dame) isn't a good start. Nevertheless, his suckitude led to a 9-6 victory for the Brew Crew. Three off those runs off Samardzija came off the bat off Bill Hall, in the form of a three run homer in the first inning. Hall has been playing pretty darn well since he returned to the lineup, which is most likely due to his eye surgery, as well as his desire to actually live up to his contract. Good for him. 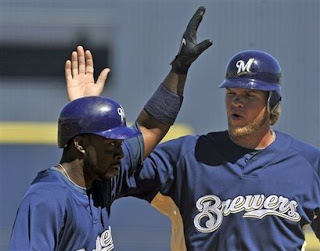 Also playing well in this one was another Brewer that I used to think enjoyed being booed, Corey Hart. The Lion King - look at him - was 3 for 4 with 2 runs and an RBI. He's hitting .429 in the exhibition season, which has prompted me to take my Corey Hart All-Star jersey shirt from the "Never Wear Again" pile into the "Wear If Everything Else is Dirty" stack. Good for him as well. On the mound side of things, Dave Bush gave up only one run in four innings for the win, while Chris Narveson got the save. Sam Narron kind of sucked though. Spielbericht. Spieler vom Spiel: Corey Hart. Elsewhere, it looks like Ryan Braun is going to stay with Team USA for treatment the injury to his right rib cage. Team USA will be taking on Puerto Rico on Tuesday night because of the 51st state's loss to Venezuela on Monday. USA got killed by Puerto Rico 11-1 just a few days ago, so this should be interesting. The winner will then take on Venezuela on Wednesday. Kind of weird, but whatever.